Stonewall Gazette: LGBT Mural Vandalized - Again! LGBT Mural Vandalized - Again! 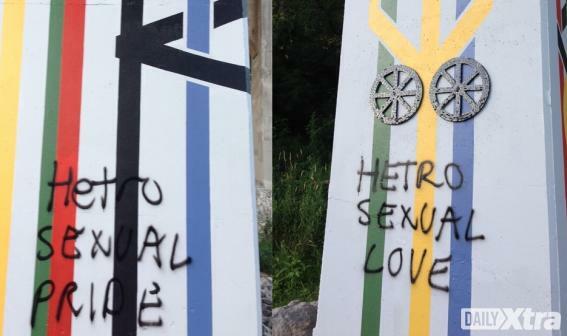 Earlier this week, our local LGBTQ centre, Qmunity was vandalized and now there's a new report that a mural created by Toronto-based artists, Anna Camilleri and Tristan R Whiston, has also been defaced - again! In fact, there have been four separate occasions of homophobic vandalism on this mural. The mural is a celebration of the contributions LGBT people have made in sports but Camilleri says her art is for all people. "I think whoever is vandalizing the artwork has found that the existence of LGBT people objectionable, and is projecting that on to this artwork, which could be interpreted in a lot of different ways.” The artists plan on checking the mural once a week and are considering using other materials that might protect their artwork. A report was filed with the police. To date there are no suspects.